As you may have heard, UNCLE PETE and the Dark Vault Gang have been busy lately making some new episodes of THE DARK VAULT OF PUBLIC DOMAIN. El Vato is busy processing the films – but was that developer or gasoline he poured into the darkroom trays? We may never know, but one thing’s certain – there’s been an explosion in THE DARK VAULT OF PUBLIC DOMAIN. And UNCLE PETE is nowhere to be found. 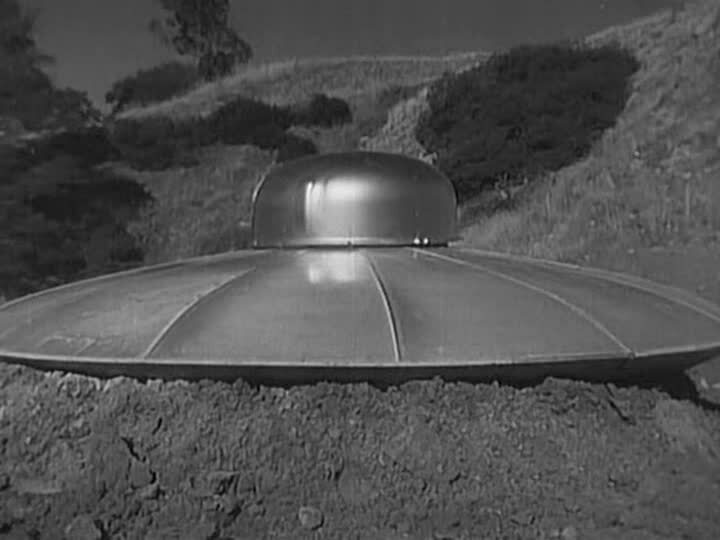 But major explosions and a host who may have been blown into orbit have never prevented the show from going on, so tune in this week for a tale of juvenile delinquents from out there – Teenagers From Outer Space! A real gone space hot rod filled with aliens looking for a planet suitable for raising their food lands on earth. Their food just happens to be giant lobster-like creatures called gargons. The aliens start out pretty unfriendly when they vaporize a happy dog to nothing but bones and license tag, from which we find out his name is Sparky. Derek (David Love), one of the aliens, finds the tag and realizes that the planet is inhabited and raising gargons here will pose a hazard to the locals (namely us earthlings). Thor (Bryan Grant) and the rest of the aliens don’t care, so Derek heads to town where he meets Betty Morgan (Dawn Anderson) and her Gramps (Harvey B. Dunn) and warns them of the impending doom. When townsfolk start getting chomped by gargons, people start to investigate, including Betty’s sorta boyfriend before Derek showed up, Joe Rogers (Tom Lockyear). But that’s not all. We have newsreel footage concerning the VAULT explosion and some investigations into who dunnit and where the heck is UNCLE PETE. But wherever he is, he still manages to also bring you an educational short from 1950 entitled Bicycle Safety and a DARK VAULT exclusive import from Canada or China (it’s hard to tell sometimes) called Cooking With Foreigners. We also bring you some groovy trailers and a peak at the place you’ll want to head to this summer – VITOLAND PARK! It’s not too late to plan your vacation trip! So tune in this Saturday, January 30, 2016 from 10PM to midnight on channel 4 in the Binghamton area, channel 99 (Elmira/Corning/Hornell), and channel 17 (Sayre/Montrose and around there in PA) and remember, we have encore presentations at midnight and 2AM. It’s Teenagers From Outer Space, the next feature presentation with UNCLE PETE (somewhere) on THE DARK VAULT OF PUBLIC DOMAIN! And keep your eyes peeled for more info on the brand new episodes! ~ by UNCLE PETE on January 30, 2016.